Festival organiser Michael Eavis has revealed the 'Purple Rain' hitmaker's reps were going to meet with him in London to come up with a deal to get the late music icon - who tragically passed away at his Paisley Park Estate in Minnesota on April 21 aged 57 - to perform at the iconic event held on Worthy Farm in Somerset, South West England next month. Michael told The Sun newspaper: "I was going to meet his agent, it was all planned but it didn't happen. His death was so sad. That's a real start that we never had." Prince had never played the legendary music festival before and had turned the gig down once before in 2014, when he got "upset" because he thought it had been advertised that he would perform before he'd confirmed. Michael said at the time: "We wanted him and it got to the point where his people were talking to us about him doing it. But before he confirmed he got upset as he thought we had advertised that he was playing. 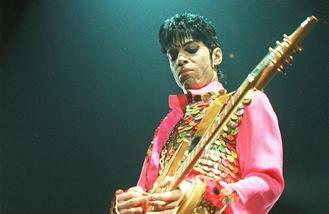 "We hadn't but with social media, rumours get everywhere, and one was that Prince was coming. So he didn't want to do it in the end." Meanwhile, Prince was also rumoured to be in "negotiations" to play at Isle of Wight Festival, but organiser John Giddings rubbished rumours earlier this year. He told BANG Showbiz: "I came up with the idea of booking Prince for the 40th anniversary of Jimi Hendrix appearing at the festival. I thought, 'Why doesn't Prince do a tribute to Hendrix? Because he is the only person who can play guitar like him.' People printed articles saying he was in negations to play Isle of Wight Festival and that was years ago and he said no. I wish he'd play the Isle of Wight Festival. But I am sorry he's not coming."